Jacques Kallis: His talent has not receded. At the end of 2011, much of the talk in cricket was over what Australia, South Africa, and India should do about their aging titans. Should Ricky Ponting and Michael Hussey (Australia) gracefully leave the stage? Were Jacques Kallis’s days as South Africa’s leading batsman and great all-rounder over? How would India replace its superstar triumvirate of Rahul Dravid, Sachin Tendulkar, and V.V.S. Laxman? At least in the case of two of the sides the answer has become clear in the New Year: No. After a string of failures, Ricky Ponting scored his 40th Test century (134), even though he almost ran himself out on 99. Michael Hussey showed his true consistency and grit with an imperious 150 not out in a record stand of 334 with Michael Clarke. In Cape Town, Kallis followed a pair (two innings in the same game where the batsman scores zippo runs) with a magisterial 234, his highest Test innings and his 41st century. 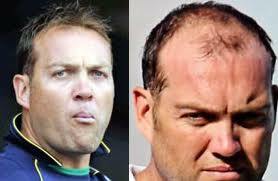 His hair may have been transplanted, but Kallis below the fringe remains firmly rooted in the South African side. India’s situation is more complicated. Rahul Dravid, aged nearly 39 years old, had his best year ever in 2011, and his stability is much in demand. Sachin Tendulkar, also nearly 39, has not been his old self, but he has gone through troughs in his two-decades-long career before and come back even stronger. V. V. S. Laxman, a year younger, has pulled India out of so many crises before that it would be tough to drop him, although his record of late has not been good. England, by contrast, find themselves in the enviable position of their oldest batsman being only 34. A young side, they possess talent in depth that could keep them at the top of the Test rankings for four or five years—unless, that is, Australia (forced to rebuild following their debacle this time last year against the Poms) find a more successful way to integrate young blood with the old timers who can still turn on the magic. This entry was posted in Australia, Cricket, England, India, South Africa, Test Cricket and tagged Jacques Kallis, Michael Clarke, Michael Hussey, Rahul Dravid, Ricky, Sachin Tendulkar, V. V. S. Laxman. Bookmark the permalink.